Currently excited: about the Maple Leafs doing well in hockey! 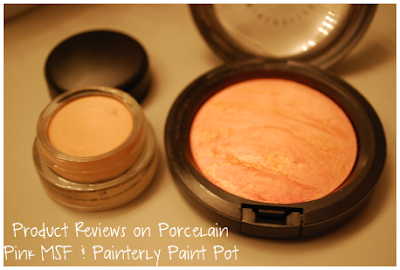 Here are swatches and my reviews on the Porcelain Pink MSF and Painterly Paint Pot from MAC! 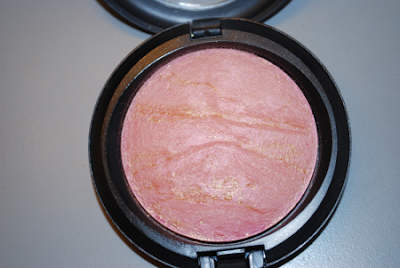 The Porcelain Pink MSF is LE and was part of the Color Craft collection. However, it was a repromoted item so I have a feeling it will be released in another collection down the road. Also, your MAC store may still have a few of these in stock. Don't be afraid to ask! I'm sure you will be able to find some at your local CCO, as well. It's a gorgeous pink color. The glitter is really more on the top layer. Once you get past that, it's even more lovely. I opted for one with a little less of the glittery gold veining. When worn on its own, it gives your skin a nice glow. 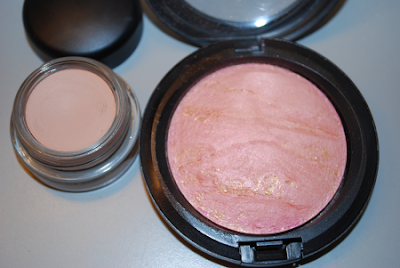 When worn over a blush, it makes the color transform and gives it a little extra pizazz. 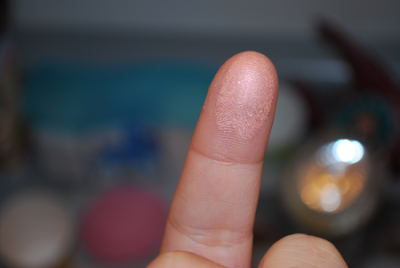 It makes for a nice highlighter shade. Since I've bought it, I've been reaching for it quite often. That's not my middle finger by the way. Haha! 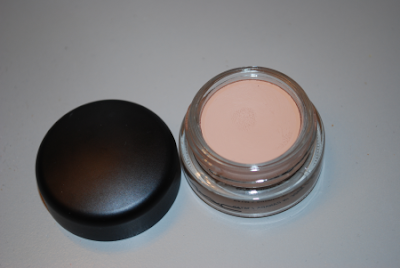 Painterly Paint Pot is a great base for your eyeshadows. It's a skin tone color and makes the colors pop. I usually still put a bit of primer on first with my paint pots, but most people use them both as a primer and base. I guess I just like double insurance. A little goes a long way! I just wanted to show you the difference in the Painterly and Rubenesque paint pots. This is just to show you that some paint pots have different finishes. 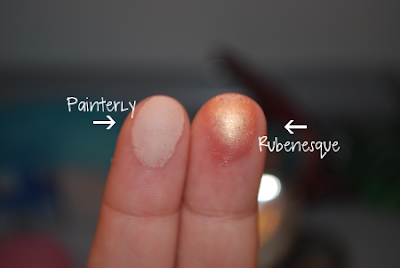 The Painterly is more of a matte shade where as the Rubenesque catches light and shimmers. Painterly does not change your shadow except by making it more vibrant in color. It also masks discoloring on your eyelids. 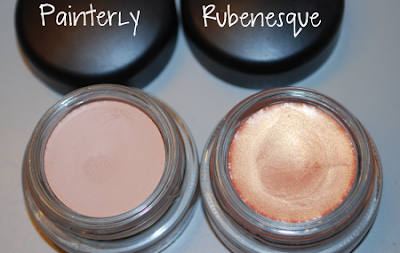 Rubenesque adds a little extra glimmer and can change the shadow slightly while also looking good being worn alone. Both are gorgeous! The staying power of these are quite nice. My makeup has lasted as long as 8+ hours with them on. Hope these reviews and swatches helped!